Location: County Leitrim, Northern Ireland. Condition: Now a luxury castle hotel. Ownership / Access: Mac Raghnaill family. Notes: Lough Rynn Castle is a luxury castle hotel on the shores of Lough Rynn in County Leitrim, Ireland situated on the historic grounds of the medieval castle and estate of the Mac Raghnaill family of Muintir Eolais. 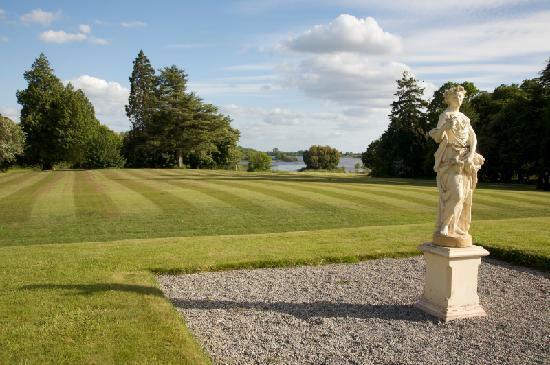 Lough Rynn Castle and estate is located on an isthmus between the lakes of Lough Rynn and Lough Erril. It is some 4 km from Mohill, 145 km from Dublin City on the N4 and 155 km from Galway City. The nearest airport is at Knock, 99 km away. Lough Rynn Castle Hotel now has forty-two bedrooms, a baronial hall, a library named after John McGahern, drawing room, piano room, bar, the award-winning Sandstone restaurant, as well as conference, bar and wedding facilities for up to three hundred guests in an adjoining function room. It is fully wheelchair accessible. A four-hundred-year-old oak tree still exists on the grounds of the estate, as does a Bronze Age tomb named Cloch an Draoi ('Druid's Altar') on The Druid's Hill between Lough Erril ("Lough Errew") and Lough Rynn, which can be dated between 1900BC and 300BC. There are also sawmills, a farmyard, arboretum, green house, French stable yards, nature trails, and terraced gardens. There are two bridges across the Rynn river which connects Lough Erril and Lough Rynn, the Red Bridge and the Blue Bridge. The principal walkway across the estate starts at the Castle, veers left by the 'Ha-ha wall and Blue Bridge on your left-hand side. Turn right with the path and you pass the crannog in Lough Rynn as you walk towards the Boathouse. Beyond the Boathouse is the remains of the Mac Raghnaill medieval castle at another shore of Lough Rynn. A left after the castle will bring you to the Rockery and Wishing Chair next to the lake. A right along the shore at this point will lead to the back entrance of the estate's centerpiece, the enormous three-tiered walled gardens which overlook the lake. Originally constructed between 1855 and 1860, upon their reopening on 5 August 2008 Lough Rynn Castle's walled gardens were the largest privately owned walled gardens in Ireland.